Culture that is appealing, vibrant, and of value always endures – while culture that is lifeless, ugly and valueless fades and is forgotten like Parthian sculpture. Greco-Roman styling washed over the Assyrian and Babylonian styles and overcame them.Greco-Roman was more appealing, enduring, and true. A Greco-Roman boar sculpture would not have a head disproportionate to the body for instance, even if it the artist might style it anthropomorphically. What is interesting and appealing is the Greco-Roman influenced Parthian art, and many of those pieces survive to this day. When tribes meet then trade of goods and trade of culture ensues – it is as natural to humans as breathing is. A small minority in every tribe or community lives in fear of change, in fear of new things, new people, new ways. They cling to the old, whether the new is represented by new culture or new technology. Sometimes that old that they cling to is ugly — and sometimes not. The things beautiful and true however cross borders and are adopted by other cultures — thus the appealing endures over time, and all things ugly enjoy a fad or a short period of propagation, but over long periods they fade away. Thus you see Zen gardens in homes in the United States, and you see neon lights all over Tokyo. Here’s an example of what can happen when cultures collide, and this will survive. So in 500 years you will still see Shakespeare in the park, you will still hear beautiful music, but the works of Maurice Bardeche will be horrific museum curio on some dark shelf, known only to a curious and studious few. Ugly and evil fades and is forgot, truth and beauty survive. So, if you want culture that survives and is cherished, look closely at what you cling to, and what you toss aside. In a clear sign of where the hate of extremists originates, a lynch mob of thousands of Muslims formed after Friday prayers in the Sudan calling for the death of a British teacher. The teacher had allowed one of her students to call their teddy-bear Mohammed. Sentenced to a lesser charge, she will serve fifteen days in prison and then be deported, as detailed at Little Green Footballs. KHARTOUM, Sudan — Thousands of Sudanese, many armed with clubs and knives, protested Friday outside the presidential palace in Khartoum, demanding the execution of a British teacher convicted of insulting Islam for allowing her students to name a teddy bear Muhammad. The protesters streamed out of mosques after Friday sermons, as pick-up trucks with loudspeakers blared messages against Gillian Gibbons, the teacher who was sentenced Thursday to 15 days in prison and deportation. The women’s prison where Gibbons is being held is far from the site. Unity High School, which is closer by in central Khartoum, is under heavy security protection. The protest arose despite vows by Sudanese security officials the day before, during Gibbons’ trial, that threatened demonstrations after Friday prayers would not take place. Some of the protesters carried green banners with the name of the Society for Support of the Prophet Muhammad, a previously unknown group. Update: more at Little Green Footballs, and you have to wonder why the government of Sudan will take time to prosecute this and not the Janjaweed murderers. 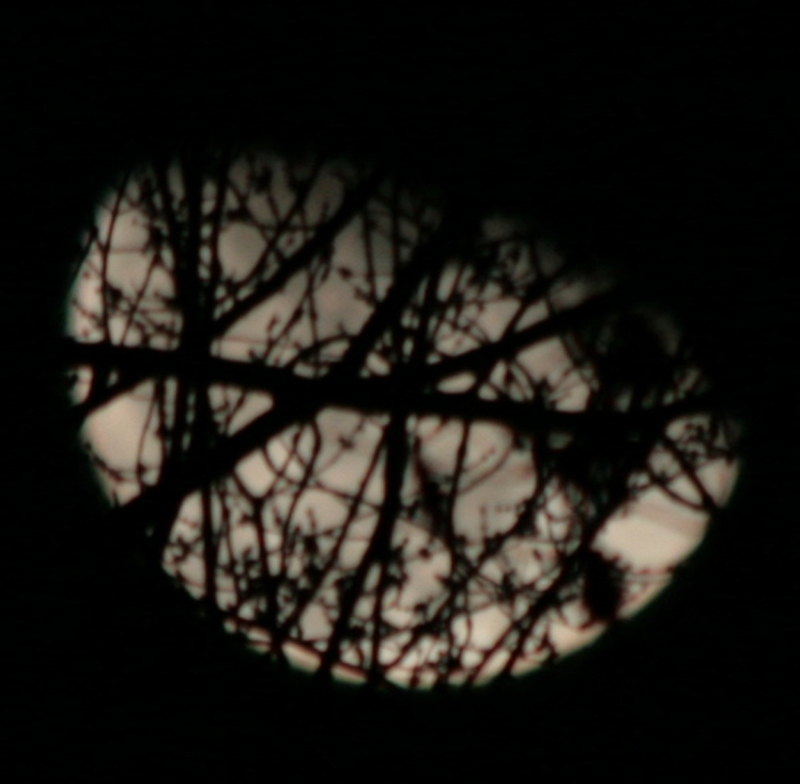 The first obscured by trees, the second sailing free above the trees. 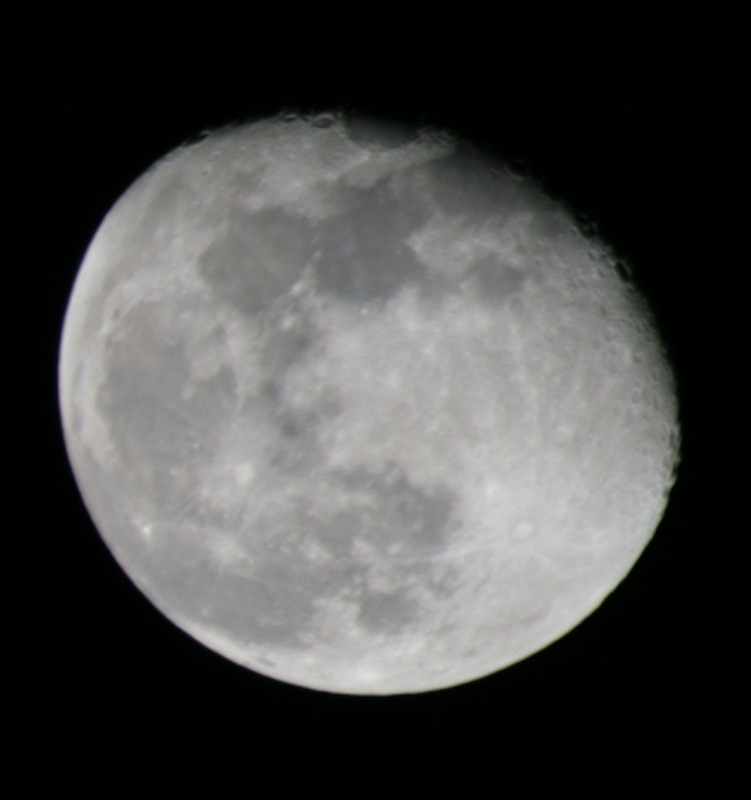 This one’s pretty good, ISO 400 / 300 mm lens , you can really see some crater definition when you blow it up. 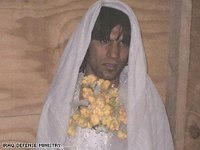 Yesterday I told of the cowardly Al Qaeda fighter who disguised himself as a bride, here he is — interupted before he could get to the altar. 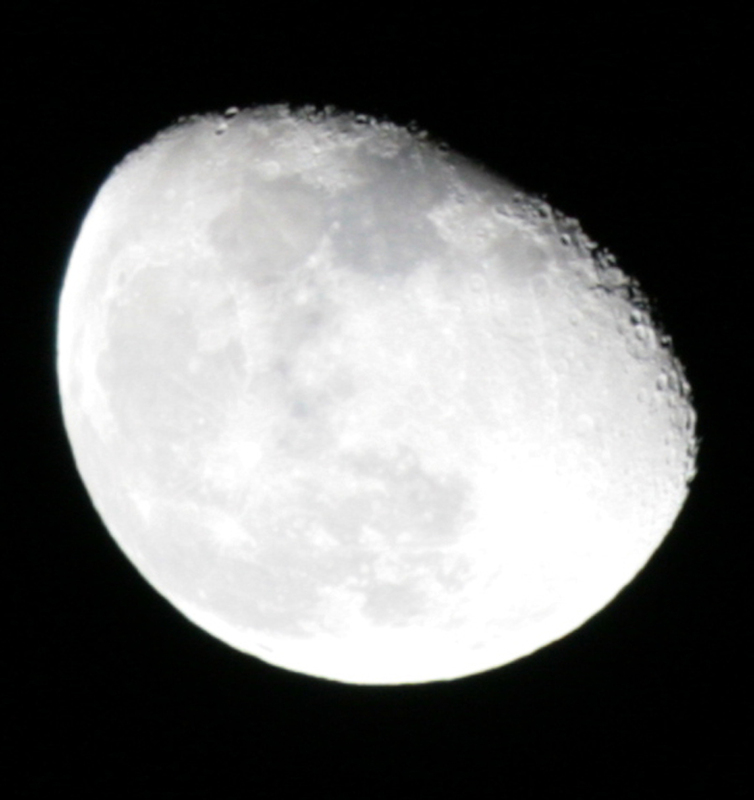 Tonight’s moon, ISO 100 / 300 mm lens. Seriously, UBL does have a new tape coming out, and they did capture two AQ in Iraq terrorists today — the wanted terrorists were disguised as bride and groom, that’s a real picture of one to the left. On the other hand perhaps terrorists are just taking wardrobe tips from Aunty Aziz. Bill Roggio has a report of a false-flag Quds force attack on the 24th in Baghdad. Apparently the Pet Market bombing was designed to simulate an Al Qaeda in Iraq attack in order to build support for the Sadrist or Iranian militias. Full story at The Long War Journal. 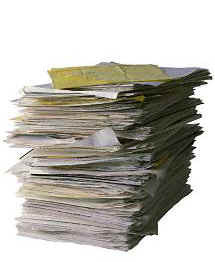 Bureaucrats are a boring, dusty, dull, but very necessary evil. They manage processes, and filing, and protocol for governments and business across the planet with means arcane to people of reason, and they usually know when it’s right to use the blue form, and when it’s right to use the yellow form. They are that necessary layer between the order or directive, and the people who get the actual work done — and hate them as you will, they are needed. During the de-baathification campaign the Sunni-baathist professional bureaucracy of Sadaam’s government was flushed en toto, and the government has been somewhat ineffective ever since. Now there’s a bill to allow Sunni and Baathists back into government service and the Sadrists are complaining — but in the end it must be done, not only for reconciliation, but also to end the paralysis, hate the idea as you will. The professionals in the old Baghdad bureaus had a pretty much unbroken office tenure back to Babylon, some are needed back to restore order in government management. More from AP. Does anyone know where I can get a form 122? I think they are blue…. The Pakistani army has upped the tempo of it’s offensive in Pakistan, switching from air and artillery attacks to an advancing ground offensive. They’ve also blockaded the region, cutting off food to the Fazlullah Taliban insurgents. They’ve also started up a jamming station to block “Radio Maulana’s” voice. MINGORA: Security forces backed by gunship helicopters and artillery have begun a ground offensive against pro-Taliban militants, killing at least 35 of them and losing two soldiers, the military said on Sunday. It was the first time ground troops had been used in the Swat region, said army spokesman Major General Waheed Arshad. He said the troops had gained control of mountaintops overlooking three militant-held villages near Mingora in an operation that was launched late on Saturday, reported AP. The troops controlled all entry and exit points to these villages, he added. He said 15 soldiers were also wounded. “The strongholds of militants are being hit. Troops have demolished their bunkers and destroyed a checkpost,” Arshad said. Meanwhile, Swat Media Centre spokesman Amjad Iqbal told reporters that three policemen had been injured in fighting in the Balogram, Rahimabad and Barikot areas. Online reported that two of the policemen had sustained minor injuries when militants in Balogram and Rahimabad shot at a mobile police car. In another incident, a Suzuki van parked along the roadside exploded on Saturday night, injuring one soldier. This is good news, the only worrisome nettle in the stew is that the last time this particular group (TNSM) became highly active it was to mask the escape of Osama Bin Laden from Tora Bora. So it beggars the question: What is happening elsewhere in the hinterlands of the frontiers? In Political news, Nawaz Sharif has returned to the country to acclaim from his party, and with only minor interference from the government ( a few PML-N activists were arrested) He vows that he will participate in elections with the All Parties Democracy Coalition (APDC) if the PCO emergency rule order is dropped, and all activists for all parties are freed. Benazir Bhutto is claiming credit for the return of Nawaz, and Nawaz is stating that he made no deals to get back. In the background President Musharraf has promised to resign as Chief of Army Staff, removing the uniform (wardi) on 11/29 if all goes as planned for the swear in.